As you probably know (because I told anyone who would listen), I got to be the guest picker on the ESPN Big 12 blog last week. I actually did pretty well. I picked 3 of 4 correctly, tying the pro. And technically, my pick of Texas Tech over Texas was a pick from my heart, not my head, so I could have gone 4 for 4. You can read the whole thing on the ESPN Big 12 blog. Speaking of the TTU/Texas game, it creates a nice family rivalry with some of my Dad's side of the family. I'm a Tech fan, and so are my cousins Rhonda and Derek. The other cousins and my Uncle H are Texas fans. I can understand why Uncle H supports the Longhorns, considering he went to Texas and is in their Athletic Hall of Fame and all, but I can't think of any good reason that the cousins support the Longhorns other than maybe they were dropped on their heads as toddlers or something. Anyway, we had Thanksgiving lunch at Uncle H's and Aunt N's house this year. Derek and I showed up in our red and black TTU gear. We were distinctly in the minority to say the least. There was a little trash talk (mostly me, naturally) and then it was time to eat. I got my plate loaded and found a seat. And then Uncle H brought over a "centerpiece" for the table. But it didn't go in the center. It went right in front of ME. And it wasn't really a centerpiece. 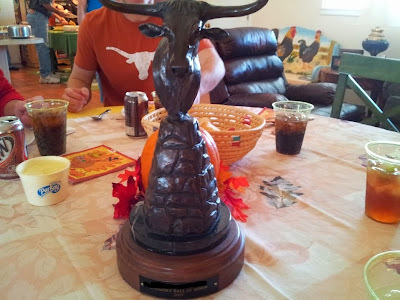 It was his UT Athletics Hall of Fame trophy. The Eyes of Texas were upon me, all Thanksgiving day. The Eyes of Texas were upon me; I could not get away. What are you looking at, Bevo? As any football fan knows by now, Texas Tech did NOT triumph over the Longhorns. I had to eat a little crow pie. But I'm a big girl; I don't dish it if I can't take it. And crow pie is still pie.